The FACTOR 1.5x1.5 light is a powerful bi-color LED light panel ouputting ~6,500lx at full daylight color temperature, with no hotspots, no multiple shadows, all in a sturdy light that's perfect for in-studio shoots or full-scale location productions. It's perfect for shooting both photo and video. You get full control over the brightness and color temperature, and you can run it on any household current or use two V-lock style batteries. 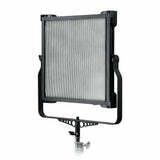 The FACTOR is the next step in the evolution of the LED panel for photographers, filmmakers and broadcasters. We know because we’ve been working on specialty lighting for years, including our award-winning LED-100WA and FlapJack LED Edgelights. With the FACTOR 1.5x1.5, we are combining powerful output with our solutions for two of the main problems of conventional bi-color LED panels. When you shoot with a regular LED light panel, you've probably noticed that the light output is often harsh. All of those LEDs mean lots of nasty micro-shadows, and an unflattering cast on faces. The FACTOR 1.5x1.5 light, however, features LED chip technology and a built-in diffuser. The LED chips are set deep into the body of the light instead of being right up against the diffuser - this approach softens the light output without sacrificing power. There are no hotspots, no multiple shadows. The other significant problem with conventional bi-color LED panels is that "bicolor" means half power - a 500 LED bi-color light panel gives off the same amount of light as a 250 LED full daylight panel. 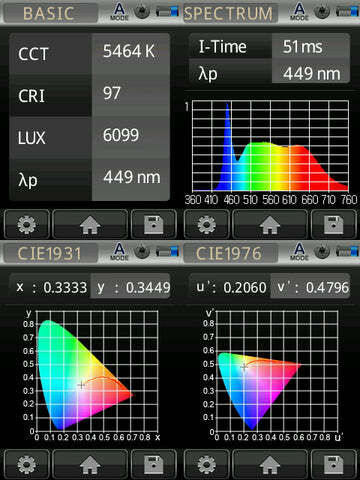 The FACTOR 1.5x1.5 difference is that the light features accurate and powerful LED chips instead of bulbs. The tungsten LED chips are tucked in between the daylight LED chips. This compact and efficient design means that we can offer dual color performance & flexibility without the power loss of a conventional bi-color LED panel. Speaking of power: the FACTOR 1.5x1.5 outputs ~6,500 lumens at full daylight and ~5,300 lux at tungsten color temperature. You can run the FACTOR 1.5x1.5 on AC power using the included adapter. The maximum draw is 200 watts, so you can run it off of any regular household outlet. You can also run the FACTOR 1.5x1.5 for about 80 minutes with two Sony V-lock batteries thanks to the integrated V-lock battery plates. The rear panel displays brightness level, color temperature, and this is also where you set your DMX data channel. The barn doors will help you shape the light, plus you'll get excellent color rendition because the FACTOR 1.5x1.5 has a CRI of 96 or higher. 4 Listed shipping weight is billable shipping weight as determined by shipping service provider and may vary from actual product weight. 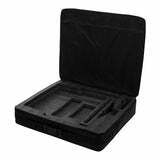 Approximate actual packaged product weight: Light only 30 lbs., Kit w/ Grid & Case 46 lbs.